All Parties are incomplete without balloons. What if, balloons are animal-shaped? Have you ever given it a thought to how the animal balloons will look-like and how they will embrace your party event? If not, we are here to five balloon animals you need to know for your parties this will help you to throw a surprising event for your kid or loved ones. Well, the name itself is very exciting. Dog balloons giraffe balloons or mouse balloons help you to throw a surprise party. You can create these shapes using your creative skills. All of these shapes are easy and can be easily made at home. The easiest of all is the dog balloon. All you have to do is to twist the balloons to a little and give the shape of a dog. Once you are able to make this dog balloon, you can try other shapes of the balloon to form balloon animals. This is the easiest thing that anyone can make at home. Sword is quite easy, and you don’t have to be masters of balloon art as well. Sword balloons are more of trendy balloons amongst kids. If you are throwing a grand party for your loving kids, sword balloons will give them an activity to play and have fun. You can make simple to complicated swords and refer to the internet and other videos to know more about how to make a sword balloon for kids. Flower balloon animal is available in the variety of forms. You can use colorful balloons and create a flower balloon animal of your own. If you are just a beginner, you can start with inflation smaller-sized balloon and then tie them together to make a flower. Once the flower is ready, you can add a tail so that your kids can easily handle the flower animal. Beginners should stay away from this kind of balloon animal. Only professionals should give it a try. If you are good at twisting balloons in any way, then this form of the animal balloon is meant for you. You will have to buy a balloon inflating pump to make the things easier for you. Balloon hat animal is one of the prominent animal balloon designs that are in demand in the market these days. If you are a startup, you can create some basic hat designs and please your guest. If you think you have patience and you can try your skills on balloons, then you can add some designs and capture the attention of the crowd. Above are five balloon animals that you need to know for the upcoming party. Hopefully, you find these animal balloons the best and worth creating. 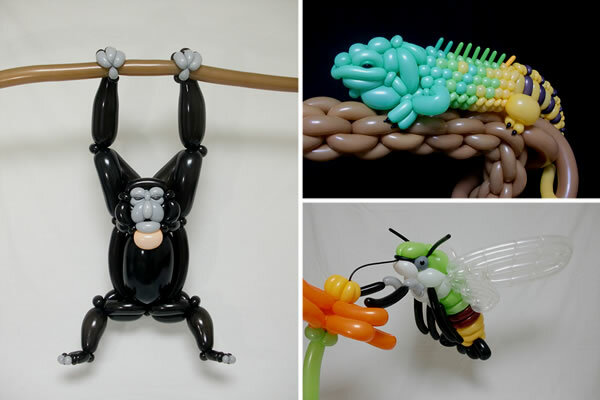 All of these animal balloons have been created after doing thorough research. You can refer to these balloon animals and make your party memorable.